Incubating peafowl eggs is exciting and frustrating. Successfully incubating peafowl eggs begins prior to the peahens laying the eggs. The peafowl should be healthy and fed on Game breeder for at least a month prior to the breeding season. We move our birds onto game breeder food in February. This has a higher protein level and calorific value to get the peafowl in optimum health. Worm peafowl at least one month prior to the breeding season, we generally worm the whole muster (Group of peafowl) during the last week of February/ first week of March. Healthy worm free peafowl will lay healthy peafowl eggs with the best chance of hatching . Remove eggs from the peahens daily. Mark each egg for identification with pencil details include the lay date and parentage. Write on both ends in case one mark gets rubbed off accidentally. Clean the peafowl eggs in luke warm water or egg disinfection and then kept in cool dry conditions for up to seven days. Keeping the eggs for longer than seven days will reduce the fertility and hatch rates of the peafowl eggs. 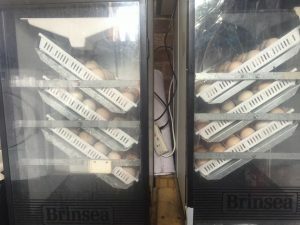 Turn the eggs daily whilst they are waiting to go into the incubator. We set all our eggs in the incubator once a week on the same day each week so we always know which days the eggs are hatching. Lay the eggs down long ways into the trays. My incubators have an automatic turner which turns the eggs every 45 minutes. Ensure the egg turner is switched on and turning regularly. I set the incubator at 37.5 degrees with 60 degrees humidity for 26 days. At 26 days I move the peafowl eggs to the hatching unit, reduce the temperature to 36.5 degrees and turn the humidity up to 90 degrees. The increased humidity is important to prevent the membranes from drying out during the hatching. I leave the chicks in the hatcher for 24 hours until they can stand before removing them to a brooder. If you do not have a hatcher move the peafowl eggs to the bottom of the incubator where the temperature is cooler or reduce the temperature if it is a smaller incubator. Do not turn the eggs during last few days to enable the chicks to orientate for hatching. The eggs will hatch between 27 to 30 days dependant on the temperature the eggs have been kept at. The hotter the temperature the earlier the eggs will hatch and the colder the temperature the later the eggs will hatch.